Born November 1st into a musical family, his mother and father sang in local productions including Gilbert and Sullivan. John is the eldest of 5 brothers, and is raised in the Victorian Mallee at Quambatook. Family moves to Croppa Creek, near Moree, NSW. Begins performing at a local restaurant and when he includes Old Man Emu, the first song he has written, it is an instant favourite, with John having to perform it some two or three times a night. John sings Old Man Emu on ‘New Faces‘ which he wins. Part of his prize is a recording contract with Fable Records. 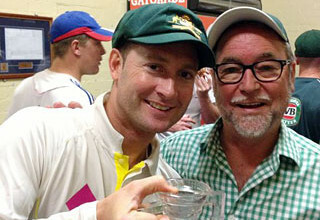 Old Man Emu is released as a single and goes to No 1 nationally and achieves Gold…the first of many Gold awards. After ten years performing all around Australia and John is asked to host ‘Travlin’ Out West‘ which emanates from NBN 3 in Newcastle and is shown on all regional TV stations across Australia for some two years. John is signed to Festival Records. His song, The Breaker helps him realise his dream that audiences are prepared to hear indigenous stories sung with real Aussie accents.True Blue is released and becomes his first defining song and sits in Australian music history as one of our truly instantly recognizable songs. Starts working his one-man show and releases two albums: True Blue and Fair Dinkum JW. Releases live album: Singin’ In The Suburbs. Following on the success of Singin’ In The Suburbs another live album The Smell of Gum Leaves is released. On a tour through Central Australia and the Northern Territory, John begins compiling impressions of inland Australia resulting in the album Road Thru the Heart. Awarded a Golden Guitar at the Australasian Country Music Awards for APRA Song of the Year: Queen in the Sport of Kings – his first Golden Guitar award. Golden Guitars for Album of the Year for Road Thru The Heart and Male Vocalist of the Year – You and My Guitar are awarded. A compilation album, All the Best, is released, along with his first longform video, Live at the Longyard. The Federal Government requests the use of the song, True Blue as the theme for its Australian Made campaign. A re-recording of this is included on the album, Mallee Boy. Mallee Boy reaches triple platinum and earns the Golden Guitar Award for Album of the Year & also Male Vocalist of the Year. True Blue is APRA’s Most Performed Country Work. John is invited to perform at the opening of Australia’s new Parliament House in Canberra. Releases Boomerang Café, featuring songs from the previous year’s tour of Western Australia. Mallee Boy awarded Best Selling Album at Country Music Awards. Boomerang Café is awarded Golden Guitar for Album of the Year and Best Selling Album. His new album Warragul is released and reaches No 1 on the National Charts and surpasses triple platinum sales. John collects three more Golden Guitar Awards for Album of the Year and Best Selling Album for Warragul and Heritage Award for Drover’s Boy. JW’s Family Album, featuring a combination of his best-loved kids’ songs together with some new fun material, is released. John’s new album Waratah St is released and passes Gold sales before it reaches the shops. Platinum award for video of Welcome to My Campfire. John moves his recording contract to EMI Music Australia. Australia Calling – All the Best, Vol 2, is released. Royalties from the single, I’ll Be Gone are directed to the Salvation Army, to help homeless kids around Australia. 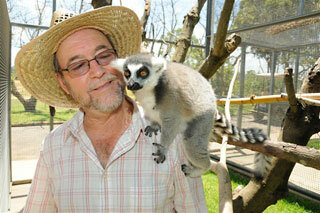 John is also awarded an AM (Order of Australia) for services to Australian Country Music and conservation awareness. JW’S Family Album awarded Golden Guitar for Best Selling Album. John, along with Slim Dusty, is a founding member of the Country Music Association of Australia. Love is a Good Woman, an album that’s draws all his love songs onto one album, is released. Mulga to Mangoes, John’s first new studio album in nearly 4 years is released & reflects the fact that John has been touring with a band for some time. The Australia Calling album goes platinum as does the video. John links up with Landcare; a government sponsored organisation seeking to help groups of people in tackling environmental problems in their local area. Records two songs, On Our Selection and Will You Vote For Me for the soundtrack of a new film version of the classic Aussie tale On Our Selection. Releases a two CD compilation, True Blue, of best tracks to date along with a book of the same name featuring John’s lyrics together with yarns about how they came to be written. Is ambushed at the book launch by the Nine Network to have his achievements recognized on the TV show, ‘This is Your Life’. Awarded Golden Guitar for Video Track of the Year – Tropical Fever (directed by Mark Jago). The True Blue compilation goes triple platinum and lends its name to a TV series John does for Foxtel, interviewing prominent Australians. Visits London and Dublin for performances. Mulga to Mangoes awarded Golden Guitar for Best Selling Album of the Year. Inducted into the Roll of Renown (Country Music Hall Of Fame) at the Australian Country Music Awards in Tamworth, NSW. Is one of three presenters on ‘Bush Telegraph’, a TV show about unique inland Australians which airs nationally on Channel Seven. He discovers a song by the same name while judging a bush band competition. It becomes the theme for the TV series and is included among a batch of originals on the platinum album, Pipe Dream. A concert for the Queensland Olympic Council leads to more Olympic fund-raisers for other states. Begins writing an article for each issue of the quarterly magazine, the Weekly Times Country. Golden Guitar for Pipe Dream for Best Selling Album of the Year. Returns to England for a solo tour. Releases For Aussie Kids album and video, recorded live at Nyngan while travelling on the Variety Club ‘Bash’. His duet of Raining on the Rock with Warren H Williams wins best single at the Deadly Sounds Indigenous Awards and they perform it at the ARIA Awards…still one of the most talked about performances in the history of the awards. The Way It Is is released & passes Platinum sales. An accompanying TV Special and long form video, filmed around a campfire in the Northern Territory, are also released. Presented by EMI with an award acknowledging sales in excess of 2.5 million in Australia. Suggests to Rod Macqueen, the Wallabies Coach, that Waltzing Matilda is the song to inspire the Wallabies against the All Blacks. On 28th August performs Waltzing Matilda at Stadium Australia, Sydney in front of a (then) world record rugby crowd of 107,042. A tradition commences. John is asked to sing True Blue on stage at the welcoming home dinner for the victorious World Cup Cricket Team; sings the Australian National Anthem at the Bledisloe Rugby Test match in Auckland. The True Blue album entered the New Zealand Top 50 ‘Pop’ Chart shortly after. After being inspired by the Wallabies John writes & records A Number On My Back. Performs Waltzing Matilda at the Rugby World Cup Final in Cardiff with Rolf Harris. A Number On My Back, is played while they run their victory lap. Wins 3 Golden Guitars at the 28th Tamworth Country Music Awards: Bush Ballad of the Year – Three Sons, Heritage Song of the Year – Campfire on the Road and Best Selling Album of the Year – The Way It Is. The album goes platinum and the video of the same name goes gold. Tours New Zealand for the first time. Records a duet with Jimmy Little, This Ancient Land which is accepted as the official song for the Aboriginal Reconciliation event Corroboree 2000, which sees a huge crowd walk the Sydney Harbour Bridge in support of Reconciliation. Performs at the Official Opening Ceremony of the Sydney 2000 Olympic Games. John performs Waltzing Matilda on the US network NBC’s Today Show who are in Sydney covering the 2000 Olympics. Anthems – A Celebration of Australia CD and video released featuring 20 of John’s most patriotic recordings including Waltzing Matilda 2000 with the 107,000 voices from the 1999 Rugby Bledisloe Cup game at Stadium Australia. The CD and video both go gold. Plays 10 concerts in London, Edinburgh and the Midlands. Year of celebrations for the Century of Federation commences with John performing at Federation events in all States of Australia. Also represents Australia at the Opening Ceremony of Winterlude in Ottawa, Canada. Performs Sir Don at Sir Donald Bradman’s Memorial Service at St. Peter’s Cathedral in Adelaide, a song he had written when requested by Ray Martin for a Nine Network TV Special on Sir Donald. A month off travelling through Queensland to Cape York sees him gathering material for his new album. Gunyah released and quickly goes gold. 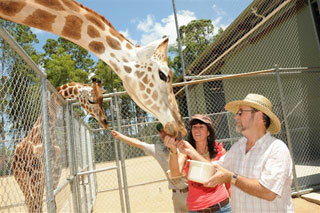 Also I’ll Sing You the Outback DVD/Video filmed in the Numinbah Valley, Qld. John’s song I’ll Sing You The Outback accepted as the Official Song for YEAR OF THE OUTBACK 2002. Elected President of Country Music Association of Australia. Awarded Australian Government Centenary Medal for services to Australian society for singing and song writing. Another compilation album True Blue Two CD/DVD, released along with a new book True Blue Two – More Stories & Songs of Australia. 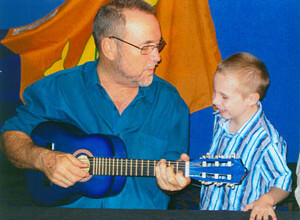 John is invited by the Prime Minister John Howard to travel with him to Bali to perform Waltzing Matilda at the 1st Anniversary Memorial Service on 12th October, 2003. John teams up with his musician mates, Pixie Jenkins (on fiddle) and Warren H. Williams (on guitar) and the True Blue Reunion tour gets under way. Wins 2 Golden Guitar Awards for Vocal Collaboration of the Year and Single of the Year for Raining on the Plains duet with Sara Storer (bringing his total to 20). Receives the Tex Morton Special Award from the Tamworth Songwriters Association Inc. Invited to take his True Blue Reunion show to the USA. Releases a live double CD and DVD of the True Blue Reunion show under the title – Mates on the Road. 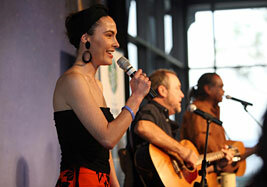 Tours extensively throughout the Northern Territory, and Northern Western Australia to search for new songs. Tours New Zealand. Chandelier of Stars, John’s 35th album is recorded with Pixie Jenkins, Warren H. Williams and a guest appearance from Chad Morgan. John is listed No 14th out of 100 of the most trusted people in Australia in an exclusive national survey conducted by Australian Reader’s Digest. We Love This Country CD released in association with the Caravan, RV & Accommodation Industry. The CD is made up of 15 Travelling Songs to accompany travellers on their holiday trips around this amazing country. Chandelier of Stars CD goes ‘Gold’. Chandelier of Stars DVD released. Golden Guitar Awards – Album of the Year, Highest Selling Album – Chandelier of Stars, Bush Ballad of the Year – Bells In A Bushman’s Ear. Tiara Awards (Tamworth Independent Artist Recognition) – Vocal Collaboration for Wrinkles with John Stephan. Stan Coster Memorial Bush Ballad Awards – Album of the Year – Chandelier of Stars and Songwriter of the Year for Bells In A Bushman’s Ear. Victorian Country Music Awards – Trailblazers Heritage Award for The Camel Boy. John represented Australia at Festival Interceltique de Lorient (Celtic Festival) in France headlining 150 Australian performers. John was honoured to be asked by the Prime Minister to perform at the function held at Parliament House in honour of the two Beaconsfield miners and rescuers. Following the tragic death of Steve Irwin, John was greatly honoured to be asked to sing True Blue and Home Among The Gum Trees at Steve’s Memorial Service. A DVD of the Service was released worldwide and all proceeds were donated to Wildlife Warriors Worldwide Fund. John released his album WILDLIFE WARRIORS: IT’S TIME on 22nd November 2006, at the Watersedge Restaurant over looking the magnificent Sydney Harbour, a compilation of his environmental songs written over the years and featuring his new song, dedicated to Steve Irwin, Wildlife Warriors: It’s Time. The Platinum Collection released comprising 62 John Williamson classics. 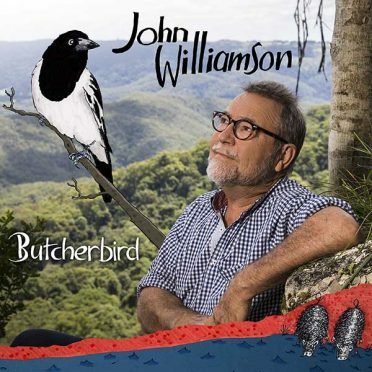 John commenced the year performing at the Woodford Folk Festival in Queensland and continued throughout the year touring his ‘Wildlife Warrior Tour’ with his mate, Warren H. Williams to all states of Australia. John also performed with his singer/songwriter daughter Ami on several occasions throughout the year. A highlight of the year was in July when various country music artists performed at a ‘JW Tribute Concert’ in Tamworth. In October John met up with a bunch of Aussies on a ‘True Blue Tour’ in France touring the countryside and attending the Rugby World Cup 2007 games. The tour included some memorable visits to battlefields of the Somme and Normandy. December – Workshops begin for the musical ‘John Williamson’s – Quambatook’ to be performed in 2008 featuring Darren Coggan and Belinda Wollaston..
Rehearsals underway for Quambatook – The Australian Folk Musical which features over twenty songs written by John woven into a story by Simon Heath. The musical, based on the early days of the Williamson family in Quambatook, Victoria and their quest to see ‘The Rock’, had its world premiere at the Evan Theatre, Panthers World of Entertainment in Penrith, NSW in February and received great audience reaction. John hard at work writing and recording songs for his new CD. Hillbilly Road, which was released in August, reached No. 1 in the ARIA National Country chart and Top 6 in the ARIA Popular Album chart. The Hillbilly Road Tour staring John Williamson with special guest Warren H. Williams kicked off in Brisbane and visited all mainland states by the end of the year. 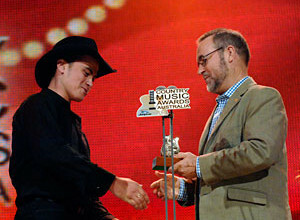 JW wins his 24th Golden Guitar at the Country Music Awards of Australia in January. ‘Australia Is Another Word For Free’, written by John, won Bush Ballad of the Year. 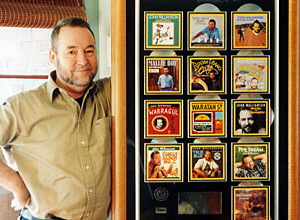 The song performed by John Williamson, Warren H. Williams and Amos Morris became the fourth single from the best selling album Hillbilly Road, when it was released on Australia Day accompanied by a brilliant video clip by award-winning director Mark Jago. Having already been awarded a gold record in 2007, The Platinum Collection 3CD set reaches platinum status in March. In late May, John commences filming the Gosling brothers’ documentary ‘Song of the Outback‘. 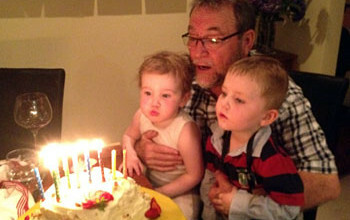 After several frustrating delays, the program featuring John’s songs, and John as the narrator, has its world television premiere in June 2011. On 21st January, John Williamson was honoured in Tamworth by the Governor-General Her Excellency Ms Quentin Bryce AC for his 40 years in the entertainment industry. During the annual country music festival, the Governor General presented John with a special glass-etched award for his milestone year congratulating him on his achievement. Absolute Greatest John Williamson: 40 Years True Blue 2CD set and Absolute Greatest John Williamson: 40 Years True Blue DVD set are released on 19th March. John celebrates the 40th anniversary of the release of his debut single Old Man Emu on 4th June. On 27th October, John Williamson is inducted into the ARIA Hall of Fame by Senator Bob Brown, who declares that John’s music “…makes us all feel good under the Southern Cross”. Performs landmark concerts at the Sydney Opera House with the Sydney Symphony Orchestra on 29th & 30th October. Presented to John Williamson in recognition of 40 Years True Blue. This plaque is awarded in tribute to four decades of great stories and songs . . . and making Australia a better place. With respect and best wishes from all your mates at EMI Australia. John Williamson: In Symphony – a live DVD & CD set recorded with the Sydney Symphony Orchestra is released on 28th January. On 28th August, 25 years after the historic ‘Australian Made’ ad campaign launched True Blue into Australia’s collective lexicon, reporter Peter FitzSimons looked at the origins of John Williamson’s iconic song for the Channel 7 program ‘Sunday Night’. In December, John signs with Warner Music Australia. Managing Director Tony Harlow is quoted as saying that “John Williamson is a great person, a great artist and a great Australian…” and that WMA looks forward to “bringing a legendary artist to a new home busting to work with him”. On Friday 27th January, The Big Red, a brand new twelve track studio album is released nationally via Warner Music Australia. John performs at the special 70th anniversary dinner of the Kokoda Campaign held in the State Dining Room – National Parliament, Port Moresby, Papua New Guinea on Saturday 28th April. 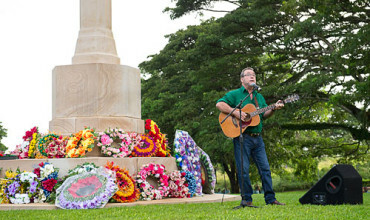 Earlier that week, he played at the conclusion of an inspiring Anzac Day Dawn Service at the Bomana War Cemetery. John is invited by the Prime Minister Julia Gillard to travel with her to Bali to perform at the 10th Anniversary Memorial Service on 12th October, 2012. Whilst there, he performs Flower On The Water, a song inspired by his visit to Bali for the 1st Memorial Service in 2003. On Sunday 10th March, John marries Meg Doyle at an intimate wedding set in a native Australian bush garden attended by their closest family and friends. John Williamson has performed at many spectacular venues but it will be hard to beat his concert on Monday 8th July. At sunset, John found himself 35 kms outside of Birdsville atop Big Red (the largest sand dune in the Simpson Desert) playing a very special fund raising event for Diabetes Type 1 research supported by The Big Red Run organisation. A Hell Of A Career, an historic 2CD album containing 44 legendary John Williamson tracks including 4 new recordings is released on Friday 19th July. On 25th January John wins a Golden Guitar Award for Vocal Collaboration of the Year with Sara Storer for Pozie bringing his overall total to 25.